Marie A. Hanni, 64, of Easton, died Saturday, March 1, 2003, in the VNA Hospice at St. Luke's Fountain Hill. Born: August 24, 1938 in Easton, a daughter of the late Joseph and Mazel Jabour Hanni. Personal: Miss Hanni was employed as a clerk at the Easton Area Earned Income Tax Office for many years. Prior to that she was employed by the Easton Fruit and Produce Company as a bookkeeper. 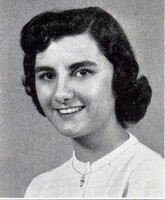 She was a 1956 graduate of Easton High School. Membership: She was a member of Our Lady Of Lebanon Maronitr Catholic Church, Easton, and the St. Theresa Sodality of the church. Survivers: a brother, the Reverend Mr. John A. Hanni of Palmer Township; a neice, Lisa Vanwert, of Clark summit, Pa., three nephews, John of Coraopolis, Pa., Joseph of Dunmore, Pa., and William, of Hoboken, N.J., and seven grand neices and nephews. Services: 9:15 a.m. Tuesday in the Morello Funeral Home 12th and Lehigh St., Easton. A Divinr Liturgy will be celebrated at 10 a.m. in the church, 4th and Ferry St., Easton. Call from 7 to 9 p.m. Monday in the funeral home with Prayer of the Incense at 8 p.m. Burial will be in Gethsemane Cemetery, Palmer Township.